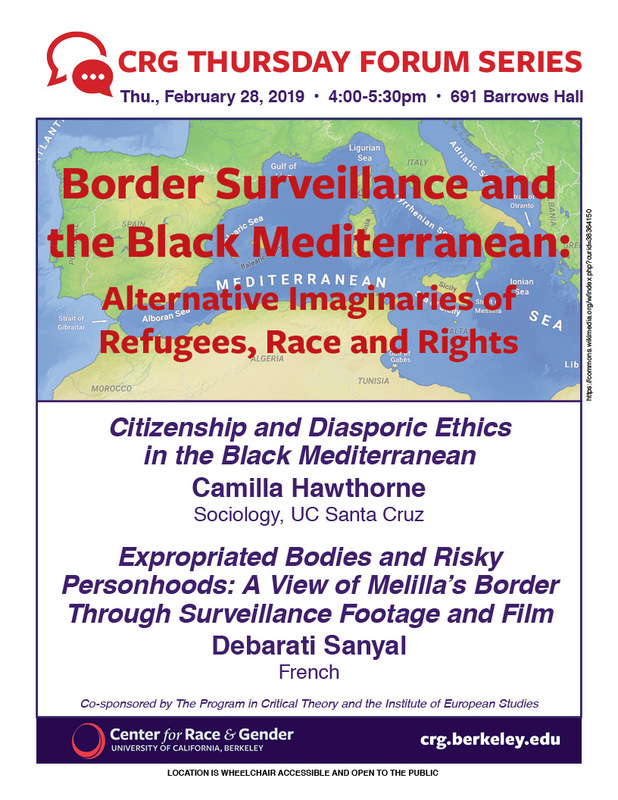 This talk examines the possibilities and limitations of the “Black Mediterranean” (which emphasizes the power-laden relations of cultural exchange and racial violence linking Europe and Africa) as an analytical framework for understanding the historical and contemporary forms of racial criminalization and racialized citizenship in Italy. The emergent “Black Italian” movement in Italy has been increasingly confronted with the limits of national citizenship as a means for addressing racial inequality. In response, activists have begun to turn toward alternative political imaginaries and practices of community that extend far beyond the Italian nation-state. In this context, what can the Black Mediterranean open up in terms of new political praxes and transgressive alliance? Specifically, how might this framework help to bridge Black liberation politics in Italy with refugee rights mobilizations? New technologies of border control differentially target moving bodies in relation to their “risk” factor, scanning them according to the tropes of colonial racism, as swarms requiring identification, detention or expulsion. But under humanitarian governance, this battle becomes an operation in which the illegalized body is both a security threat and a life to be secured. The port city of Melilla, a Spanish enclave on the other side of Morocco is, with Ceuta, the European Union’s only land border with Africa. Fences topped by barbed wire separate these two worlds while redrawing the boundaries of the human species itself. The border’s surveillance is ensured by fixed and infrared cameras, motion detectors, and patrols designed to canalisar el flujo migratorio, in the words of a Guardia Civil. Those Who Jump (2016) a film by Abou Bakar Sidibé, Moritz Siebert and Esteban Wager, documents forms of persistence and emergence among the migrants and refugees at Melilla’s border. These forms compel a reconsideration of the human, embodiment and rights. Camilla Hawthorne is Assistant Professor of Sociology at UC Santa Cruz. She is a principal faculty member in the Critical Race and Ethnic Studies Program, and a faculty affiliate of the Science & Justice Research Center at UCSC. Camilla received her PhD in Geography with a designated emphasis in Science and Technology Studies from UC Berkeley in 2018. She also holds an MPA from Brown University. Camilla’s work addresses the politics of migration and citizenship, racism and inequality, and social movements. Her book manuscript, Citizenship and Diasporic Ethics: Youth Politics in the Black Mediterranean, explores the politics of race and citizenship in contemporary Italy. Camilla also serves as faculty member and project manager of the Summer School on Black Europe in Amsterdam, the Netherlands. Debarati Sanyal is Professor of French and affiliated with the Designated Emphasis in Critical Theory, the Institute of European Studies, and the Center for Race and Gender. Her teaching and research interests span 19th-21st century French and Francophone literature, with a focus on memory studies; the politics of aesthetic form; nineteenth-century poetics of revolution; the Occupation and Holocaust studies, and more recently, critical human rights and refugee studies. She is a recipient of the Distinguished Teaching Award (2012), UC Berkeley’s highest recognition for teaching. Publications include Memory and Complicity: Migrations of Holocaust Remembrance (Fordham, 2015) forthcoming in French translation as Mémoire et Complicité: Héritages de la Shoah (PUV, 2018); The Violence of Modernity: Baudelaire, Irony and the Politics of Form (Johns Hopkins, 2006), and as co-editor, Noeuds de mémoire: Multidirectional Memory in Postwar French and Francophone Culture (Yale French Studies 118/119, 2010). Recent articles include “Calais’s ‘Jungle’: Refugees, Biopolitics, and the Arts of Resistance”, “Modiano’s Memoryscapes” and “Baudelaire and the Poetics of Terror”. Her current book project addresses the contemporary refugee experience in French-speaking testimony, fiction and film.